And the best thing about them...they're delicious. Sorry. I just had to say that, didn't I? Don't get me wrong; I'm not saying that animals cannot be intelligent. Just that they cannot, and never will, be as smart as or on the same level as humans. So, yes, maybe we should take them more seriously. Just not treat them as humans. If I offended anyone, I apologize. Nellie: Very intelligent comment, as always. Yet I believe you may have just mauled a straw man. I don't think that the scientists were arguing that dolphins should be treated "like humans." How would we do that, anyway? Force them to obey the speed limit? Let them apply for government assistance? And given how we treat other human beings on this planet, I'm not sure the dolphins would benefit anyway. I'm not going to get into subjects like immortal souls, but I do believe people can and SHOULD be judged by how they treat weaker creatures--whether those creatures are human or non-human. Can you tell I enjoy a good debate? (At least as much as you and your sis!) I think we should all argue like this more often. The world would be a better place. Dolphins are very intelligent. (Better then most kids at my old school, in fact.) Some people would say that they understand and, therefor, "feel" human emotions. If something is capable of that, regardless of species, then it should be treated as if it were human. However, as hard as they try, dolphins will never be human. So dolphins can act and be treated like humans, but they will never fully "be" a human. I don't think they're saying dolphins should be treated like humans ( like dressing them up in swim suits and stuff like we do to dogs) but they're saying that dolphins are incredibly intelligent animals. 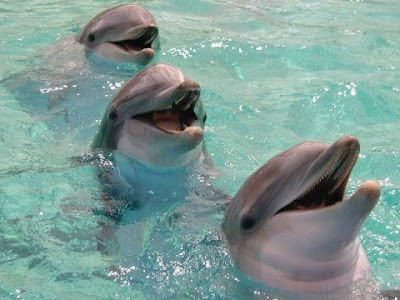 I misunderstood the scientists, I think, if they were only saying that we should treat dolphins with extra respect. Sorry about that. "The researchers argue that their work [that shows the dolphins' intelligence level] shows it is morally unacceptable to keep such intelligent animals in amusement parks or to kill them for food or by accident when fishing." I think my main problem with this is that they're basically saying intelligence means you should be treated with extra respect. If dolphins are smarter than three-year-olds then is it okay to kill two-year-olds or put them in amusement parks? What did you mean about the straw man? Oops, forgot to say this: Sorry again if I offended anyone. Also, thank you very much Ms. Miller for your kind words! The title of the article and the blog entry is "Non-Human Persons". NON-HUMAN PERSONS. Scientists aren't suggesting that we treat them as humans but as people. Just because something isnt human it cant be considered a person? What about aliens? Are they not people because they're not human? Why would they want to be human anyway? Let's think about this: we live, we eat, we pollute, then we die. We always prioritize a dying child over a tree. Why? Because it's a "human life". But why should we prioritize the child? How does it contribute to the environment? Frankly, it doesnt. It has some potential to society; in other words, humans. Yet a tree contributes and is tied directly to the environment. But, of course, humanity comes first. However, I digress. Of course, dolphins will never be humans. But I agree with Kirsten on this. It doesnt mean that we cant treat them as equals. No, I dont mean forcing them to obey the speed limit. I mean, preventing them from being hunted into extinction or being put on display in some cruddy aquarium soley for the purpose of making money. Basically, humans need to stop acting as if we're the "smartest" species on this planet. We're not. We just act like it. For all we know, there is an ancient civilization miles beneath the ocean that's more intelligent than us and is plotting our downfall via junkfood and global warming. Thanks for the article, Kirsten. I don't think we should treat ANY animal as human. I remember a quote about dogs that said something along the lines of no animal really wants to be human (actually, it said something that it is a disgrace to dogs to treat them or think of them as mini humans). But I do think people need to realize that animals are more intelligent than they give them credit for. But are humans BETTER then dolphins Nellie, when every day we kill each other, other creatures start terrible wars and destroy our own home. Although of course dolphins have been known to attack other smaller porpoises very aggressively, but if we are a higher form of thinking shouldn't we know better? Nellie: If you're debating a subject and your opponent claims you're "attacking a straw man," it means that you're not attacking her true position, but rather making it seem as if she's supporting a similar (but less defensible) position. Does that make things clear? I'm not sure I gave the best definition. In this situation, I was arguing (in essence) that highly intelligent animals should be treated with greater respect. I accused you of attacking a straw man because you implied I was arguing that animals should be treated like humans. But it was all in good fun! I really love hearing from you and Hazel. I hope you guys are on a debate team somewhere. Trickster Queen: I love hearing all these different arguments. Expect controversy! Wouldn't it be brilliant if they were proven to be sentient? Then we should deffenitly treat them with more respect. I mean if were not going to treat each over with respect why not a weaker being, cant be that, just let them be free, don't eat them and be more careful when fishing. we could always try interacting with them in the wild not in captivity. An excites me is that this i just the beginning and dolphins (and many other animals) are actually evolving to higher forms of life, so that in the distant/ near future we could say eaven if we are alone in the universe ( which i say were not) were definitely not alone on our own planet, atleast as far as intelligence goes. Wouldn't it be brilliant if they were proven to be sentient? Then we should deffenitly treat them with more respect. I mean if were not going to treat each over with respect why not a weaker being, cant be that, just let them be free, don't eat them and be more careful when fishing. we could alway try interacting with them in the wild not in captivity. An excites me is that this i just the beginning and dolphins (and many other animals) are actually evolving to higher forms of life, so that in the distant/ near future we could say eaven if we are alone in the universe ( which i say were not) were definitely not alone on our own planet, atleast as far as intelligence goes. people said "We couldn't possibly be related to APES. They are dirty and---well--- they live in trees for crying out loud!" We are ANIMALS. They are ANIMALS. We just happen to be the animals who drive other animals to extinction and mess up the planet. We need to respect them.. We need to allow them to thrive. Why do humans assume every one wants to be like us. If dolphins had a choice I am sure they would prefer no human interference. Treat them with respect, do not eat them, possibly try to teach them some things but never try to make them like us. Also keep in mind while they are intelligent it is not in the SAME way humans are intelligent. Mushroom Cloud: BTW, that dolphins electricity point was both smart and hilarious. I read In an article that scientists have a better chance of finding life on other planets!!!! They've made a probe and are going to send it to rocky earthlike planets!!!! So I agree that dolphins are smart. I came to that conclusion a long time ago. And, yes, they are probably smarter than the majority of people at my school. I get sooo tired of nobody being able to think for themselves. They ask the teachers questions that a dog could figure out. But I digress (getting a little of track there), dolphins are not humans (maybe smarter and less pollutant),and to me, "persons" means human (or humanoid... like Faeries or something). So I don't think we should call them "Non-human persons". Funny thing, today some guy was parading about my AP History class declaring he was, indeed, the Prince of Liechtenstein. Sorry for all the comments i am making, this subject fascinates. I thought dolphins were smarter than people. Oh well, the mice are the ones controlling the planet anyway. I think that dolphins should be conisdered "non-human persons". If they're smarter than a three-year-old human, chimps, and other animals, hey; why not? No, they'll never be humans, but that doesn't mean they can't be SMART. You know, it's true that dolphins will never BE humans, but that still doesn't mean that they can't be considered as smart as we are. And in reference to the-three-year-old thing, I suppose that humans at that age are not fully developed and dolphins at that point are. So, perhaps that's not the perfect comparison. As to giving animals more respect, I fully agree with that. We shouldn't be destroying other animals' habitats just for our dwellings, some too superfluous and extravagant. We need to stop killing animals that get in our way. They have rights too even if they can't state it themselves. I know this might contradict the things I said in my previous post, but I had to give the subject more thought. I think the majority of us agree that dolphins are intelligent animals, likewise most of us agree that dophins are not human. However, the position we seem to be debating is whether dolphins should be classified as "people". Again, if something isn't human it can't be a considered a person? If scientists ever discover life on another planet and they were more advanced than us in almost every way, would we not consider them people because humanity=person? True, dolphins aren't using electricity. But neither were our ancestors a couple hundred years ago. It's only been in these last few DECADES that we've evolved to lamborghinis and ipod nanos - and it's taken us thousand of years to get here. Can we honestly say that dolphins will never acheieve human-level intelligence? If we keep poaching them and allow them to fade to extinction, they never will. Kirsten: I dont like controversy either. Actually, I hate politics and government. Im more of an econ person. But that was one of my arguments for speech and debate. The issue was "In times of economic instability, the UN should prioritize poverty over the environment". It's REALLY HARD to argue in favor of the environment, especially when your opponent is throwing out statistics about how many children die in third world countries every day and the amount of curable diseases that run rampant and untreated. @_@ It was the only argument my partner and I could come up with to level the playing field. "Human lives are prioritized over the environment because we have humanized the world and consider ourselves above the ecosystem and welfare of the planet." Something to that effect. We won, but very narrowly. I agree that we should treat animals with respect, but I don't think that the amount of respect should be based on intelligence like these scientists seem to be suggesting. If you do that, you (as in people in general, not Ananka or anyone else personally) run the risk of falling down the slippery slope towards human eugenics. The difference between man and animals isn't how well they communicate, or whether they can teach each other, it's the rational human soul. Humans are rational; dolphins aren't. Humans have human dignity. We can respect dolphins (and monkeys and trees and rocks) without treating them as our equals or regarding them as "persons" as Thomas White (at the end of the article Ananka linked to) suggests we should (I assume this would mean they would receive equal protection from the law, making it a capital crime to kill a dolphin, etc.). Humans don't, and shouldn't, respect only humans, but animal's aren't people. Trickster Queen: Even worse and more dangerous than basing worth on intelligence is basing worth on how much good someone or something brings to society (or the environment or their/its family or country, etc.). Then you get into 'might makes right' 'ethics', and that's where racism and sexism and ageism and, yes, speciesism and all the other evil 'isms' come from. Race-based slavery wasn't invented after what people thought of as the discovery of differences between races. Rather, racism was invented so that people could avoid thinking about the fact that they were abusing their fellow man. Some things and/or creatures are more important and have more inherent dignity than others. A human's being human is a very good reason to respect him or her more that a tree. I love how the German constitution (random, right?) starts: "The dignity of man is inviolable. It is the duty of all public authority to respect and protect it." (Whether that statement is actually carried out in German laws is a different story, but let's not get into that.) If you don't believe in inherent human dignity, I really don't know what to say to you. I just wanted to say that I now realize it sounds like I meant that we consider ourselves superior to animals merely to justify our power, which doesn't fit with the rest of my statement at all. Upon further reflection, I realize "speciesism" (as applied to the superiority of humans to animals) is based on reason rather than bigotry and so doesn't fit with the other "isms" I mentioned. Sorry about that. I agree we should treat animals with respect, but we should do this in a way that is not classifying them as persons. There's got to be a better way. Don't bash sharks. Sharks almost never attack people. More people die of falling coconuts, per year, than shark attacks. Al Fonzo: If they are trying to send one probe to a lot of different planets, it could take a while. Rocky or earth-like planets in other systems are hard to find because right now our main way of locating them is seeing when they pass in front of their star. If they're small or at an angle, we can't detect them. On top of it all, right now, the most likely earth-like planet to have liquid water is Gliese 581-d, about 7 M[sub]earth in size, orbiting in the outer habitable zone of a red dwarf star called Gliese 581. It's about 20.3 light-years away from earth. It would take a very, very long time to get there. The article you posted talks about several new systems to *detect* earth-like planets, not sending probes. Furthermore, looking for earth-like planets will probably only yield results if the closest ET is of earth-like origin. That would mean we're following a galaxy-sized red herring if the closest ET is in fact extremely unlike life on earth. And now I look like a geek, don't I? EQ: You only look like a geek if "geek" is dolphin for "smart and well-informed". Hazel: I think your post was posted earlier than mine, right? I ask because I feel unsure whether you read all of my second post. I dont think humans should start talking to dolphins as if they understand, the same way that adults cant have long philosophical debates with infants. However, I do believe that more should be done so that our fellow inhabitants of earth dont suffer simply because humans feel superior to everything else because we're "human". I also believe that if other species were given the chance to evolve further, they could possibly achieve "human-level" intelligence. Maybe not in one, ten, one hundred years; simply consider how long it has taken US to evolve (if not monkeys to humans, then from witch burnings to gradually accepting gender, race and sexuality). Then, humanity wouldnt be able to boast that they alone are capable of "human-level intelligence". MushroomCloud: Your preschool had GOATS AND FERRETS? Im jealous. All my preschool had was a corner full of books you couldnt read because they were bigger than you, I kid you not. TricksterQueen: Yes, I think I posted before your second post was published. What I'm saying is that humans are superior to animals in a way that actually has nothing to do intelligence, or even individual moral worth. (Animals actually cannot sin, as they are not rational and therefor cannot knowingly do harm, which humans do all the time.) Humans have rational souls; they're made in the image and likeness of God. Even if you don't believe in that (I have no idea what your religious beliefs are), it's obvious that humans are different from animals, specifically more different than animals are from each other. (Did the syntax of that sentence work out? I mean the difference between humans and animals is greater than the difference between animals and other animals.) Humans (as a species, obviously most of this doesn't apply to, say, infants) have religious beliefs, bury their dead, make scientific and philosophic discoveries, etc., which animals are incapable of even desiring. We have human dignity, but we're not allowed to lord it over the rest of creation. We're stewards, not kings or gods. I think the best way to describe stewardship is that it's like babysitting: we're not responsible for creation and we don't make the rules and can't arbitrarily change them, but we enforce them (except the rules are more for us than for the rest of creation to follow), and it's not for our good or convenience, but for others'. Do you get what I'm saying (and did I get what you're saying?)? Hazel: So what it somes down to is: Humanity was created "in the image and likeness to God". Therefore, humans have "rational souls". A rational soul is the requirement legally be recognized as a person (ie, you cant be dead. you're human, but you dont have a soul anymore). Is that right? Buddhism and Hinduism, for example, teach that people are reincarnated, most notably into animals and other beings. They would then argue that an animal DOES have a rational soul then because it is the soul living in another life. Religon aside, scientifically speaking, dolphins have a CAPABILITY to evolve to human level intelligence. Studies show, as the article says, that elephants mourn their dead. Animals experience emotion, while other studies show that they can think and reason. Maybe not at a human level but its still there. I think that could qualify as having a rational soul, as per your descriptions. As I've said before, if we give them time dolphins could shatter all of our expectations and evolve to computer level intelligence (they "think" and process but have no souls) if not human level. yes, trickster queen, it did. and the goats wee great, the ferret not so much. it pooped and smelled and was locked in the bathroom once every 2 weeks so i's cae could be cleaned. It was the only bathroom in the school so we had to use the teacher's mother's bathroom in the back. she was very nice, but she never spoke, always stayed in her wheelchair and the lights were alway off in her room. it was kinda weird.oh, it was a Montessori school. It was called Little Farm and it had a large wooden elephant behind it. Trickster Queen: Well, having a rational human soul attached to your body should be what makes you legally a person, but many people's personhood is not legally recognized. But let's not get into that. Basically, I think this argument is coming down to whether what makes humans superior to animals is something inherent to humans, or something that can evolve, and we just did it first, for whatever reason. Right? Even assuming for the sake of argument that it can evolve, classifying dolphins as 'persons' would, at least at this stage, be more a matter of redefining the term 'person', don't you think? So it's also really a semantics issue. I kind of think, when dolphins (or other animals) ask for personhood, let's reconsider. I commend you guys for having a rational, intelligent debate about very complicated issues. You've put most adults to shame. Hazel: You're entirely correct. This is a semantics issue as well. We would have to redefine the word "person" to mean "an intelligent species with inherent rights that is also protected by the government" or some such thing. Furthermore, we could reconsider, but then that in itself is the issue. Should we give a creature with an unheard voice the chance to recieve better treatment and receive rights that help to protect its species? How did you enjoy the "completely child-centric experience"? Hazel: No, I didnt mean that labeling an organism a "person" is the only way that an organism will recieve good treatment. However, labeling an organism a "person" would force humans to recognize that they are not sole masters of our happy little planet. It's easy to abuse an animal because it's "just an animal" However, giving an organism the title "person" makes it harder to abuse it. For instance, although it happens, just randomly beating up another person is horrifying to most people. Likewise, if someone eats a dolphin or abuses it, people will be shocked because it is almost on par with humans. Yet, we as humans also have the choice and ability to reason and choose how we want to contribute to the planet. An I important? If I eat this squirrel and live, will I contribute to the world? That kind of thing. Trickster Queen: See, I think we are, if not masters of the planet, definitely in charge in a way animals aren't (stewardship again), and animals aren't almost on a par with us. They're really great, and they may be intelligent, but there's a huge gap between us and them. Labeling them "persons" to get people to care more seems like PETA's "Nobody would hurt a sea kitten!" campaign, and also wouldn't contribute to animal rights in general. It would either promote the idea that it's not okay to kill dolphins, but we can kill "stupid animals", or we'd say all animals are "persons" and it would become shorthand for "organism which belongs to the kingdom Animamalia". We need to just say, "Yes, animals aren't us, but they have rights, and we need to protect them because no one else will." Also, all people are important, even if they can't see how they contribute to the planet or whatever. For one thing, humans just are intrinsically important: to their families, to their friends, to whomever they might help at any time in the future, and for another thing, we need to work to make a difference. Everyone has a duty to take care of themselves, so you have an obligation to feed yourself etc.. See what I'm saying? Trickster Queen: That was a really interesting discussion, especially when it turned out the main thing we disagreed on was the semantics. Thank you! Sorry, I just had to add in my own... one cent :D I don't think humans shouldn't start talking to dolphins like they understand. It's like talking to a person who speaks only French, in English!